I’m a sucker for neatly wrapped packages and smartly presented surprises. With fall’s harvest so abundant right now, pita bread and wraps are a staple in my kitchen as a way to help this harried cook put structure to my sandwiches. Stuff a wrap or pita full of colorful roasted vegetables and top it off with some tangy cheese as a healthy and easy meal. 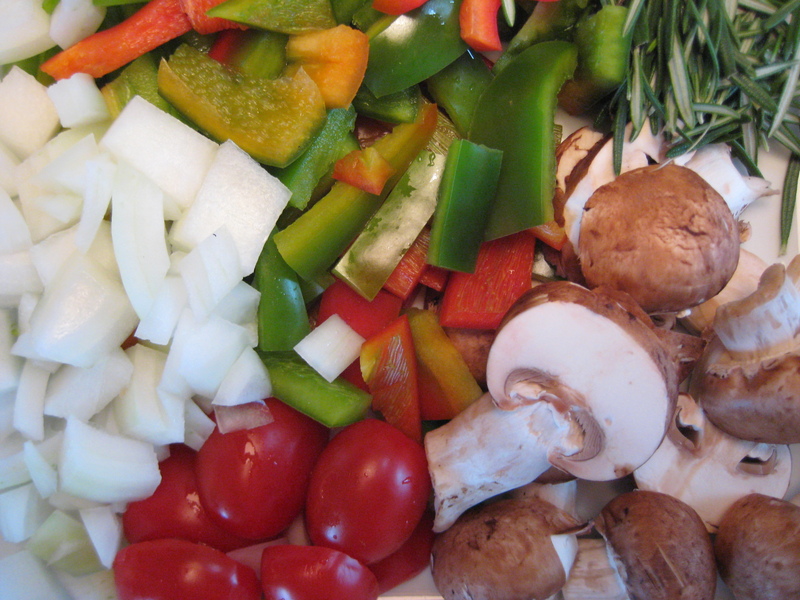 In a large bowl, toss the vegetables and rosemary with the olive oil until lightly coated. 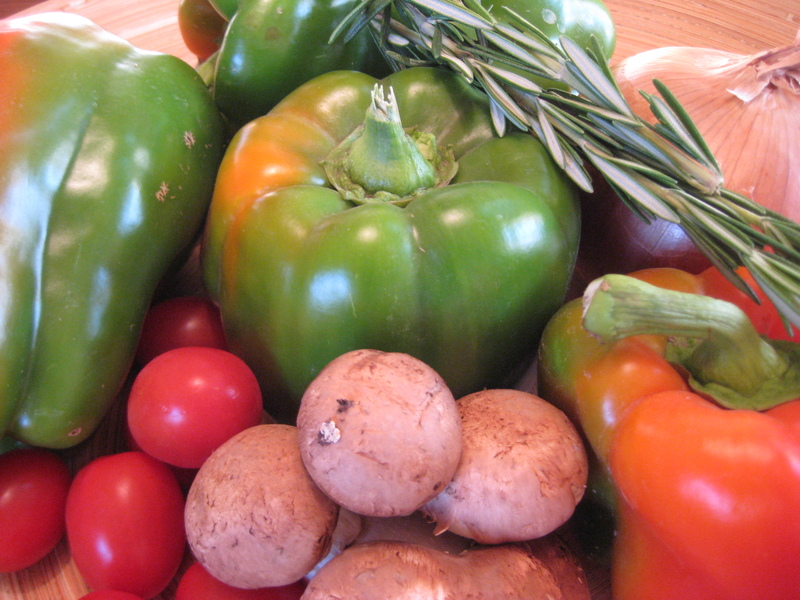 Spread the veggies out on a baking sheet so they are in one even layer, and grill or bake in a 450 degree oven for about 30 minutes until roasted and tender. 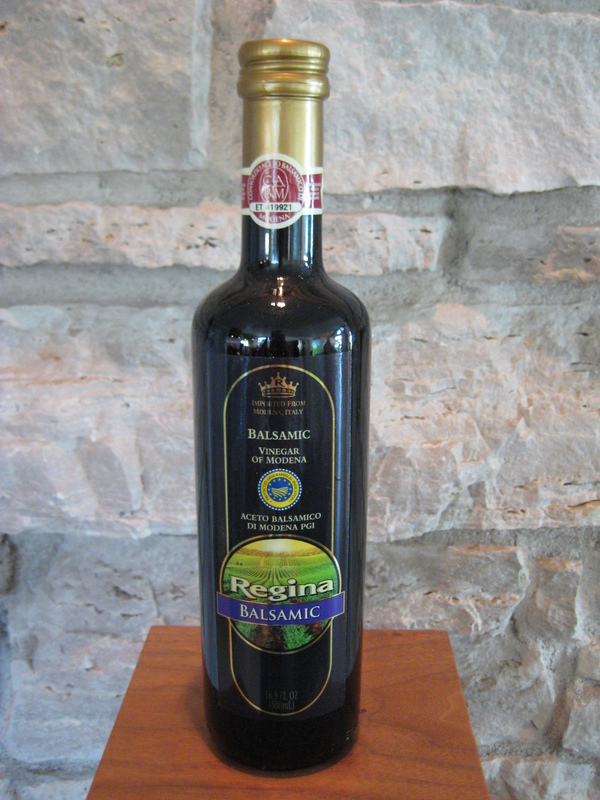 Remove for the grill or oven and drizzle with balsamic vinegar and sprinkle with a pinch of coarse salt. 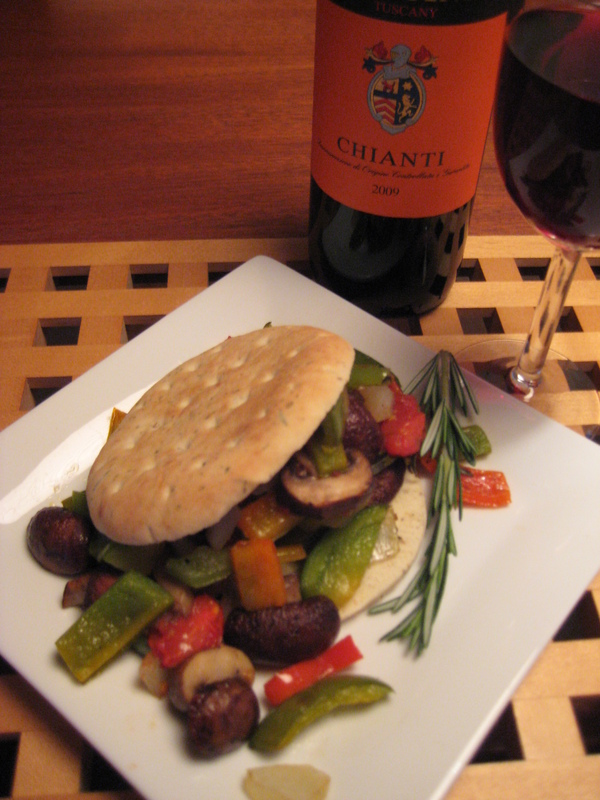 Serve in pita bread, wraps or any other bread of your choosing. 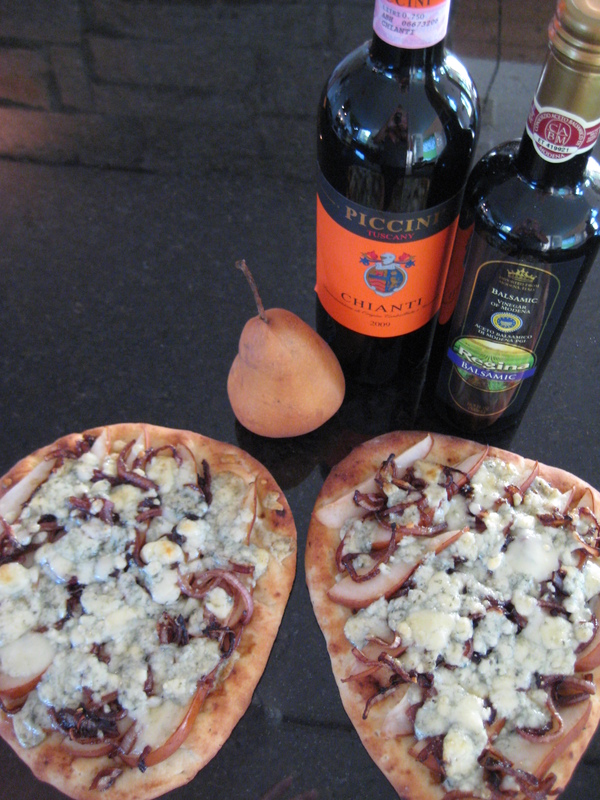 For added zing, stuff the wrap with your favorite cheese, fresh chevre is particularly nice. Enjoy with wine. Now that’s a wrap! 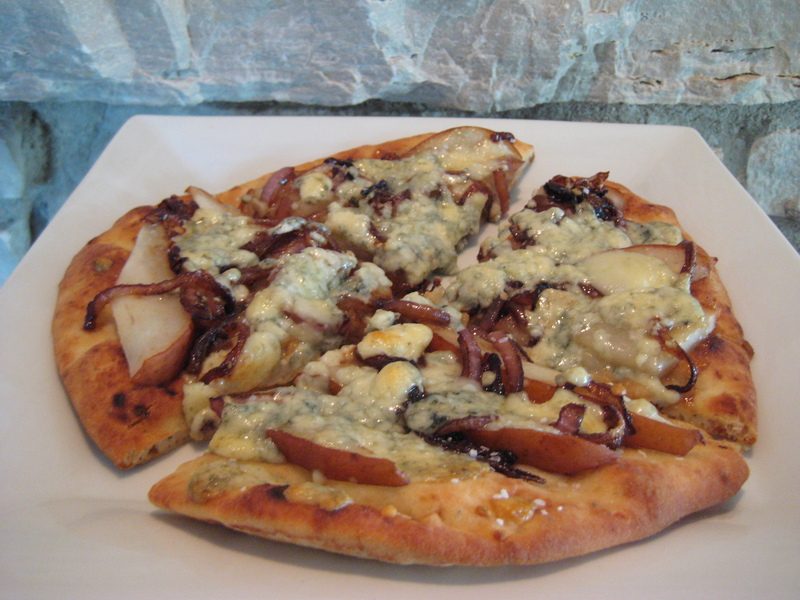 Here it is; the creme de la creme, the tastiest, most delectable flat bread pizza ever. Tastiest ev-er. Your favorite flat bread. 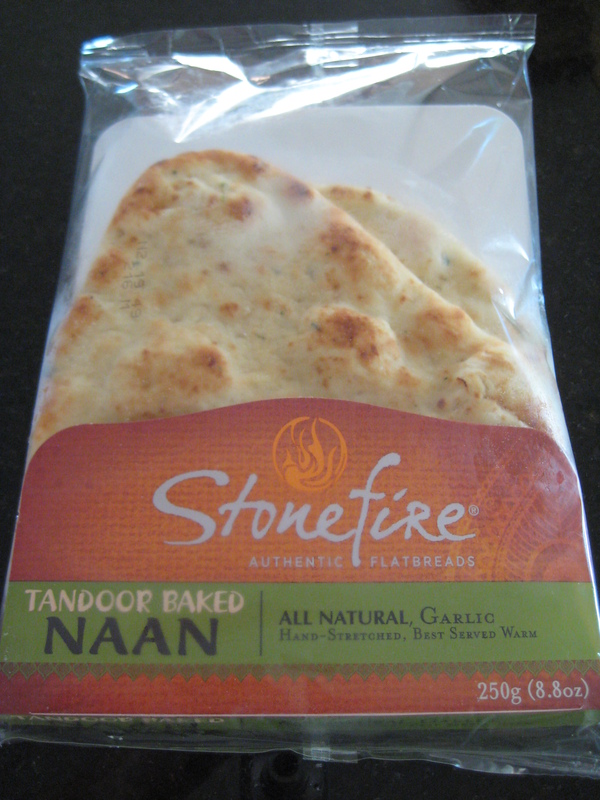 I use Stone Fire All Natural Garlic NAAN flat bread. One large red onion, thinly sliced. Two pears. 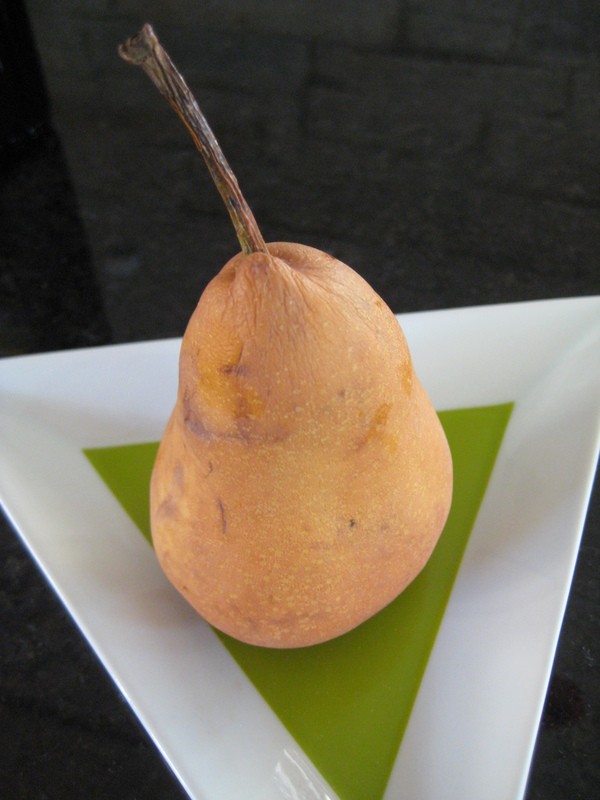 I prefer Bosc pears as they tend keep their shape and not become mushy during baking. Preheat oven to 425 degrees. Heat olive oil in a skillet. 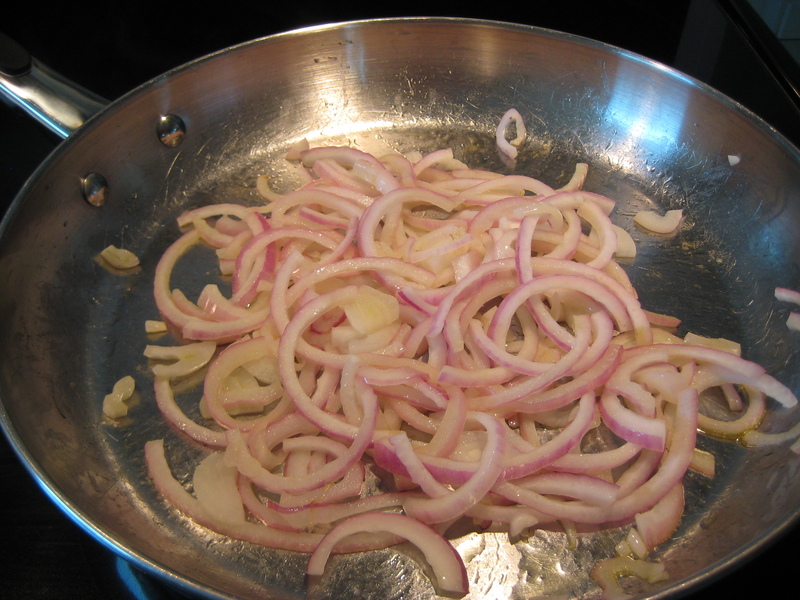 Add thinly sliced onions and saute until browned. When the onions are browned, add balsamic vinegar and saute until caramelized, bringing out the onion’s natural sweetness. 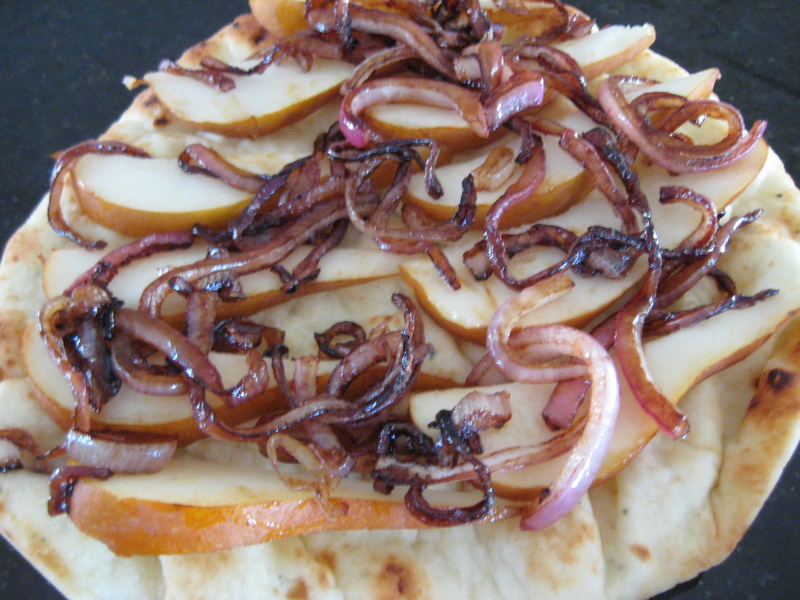 While the onions are cooking, take out the flat bread. Quarter and core the pears. 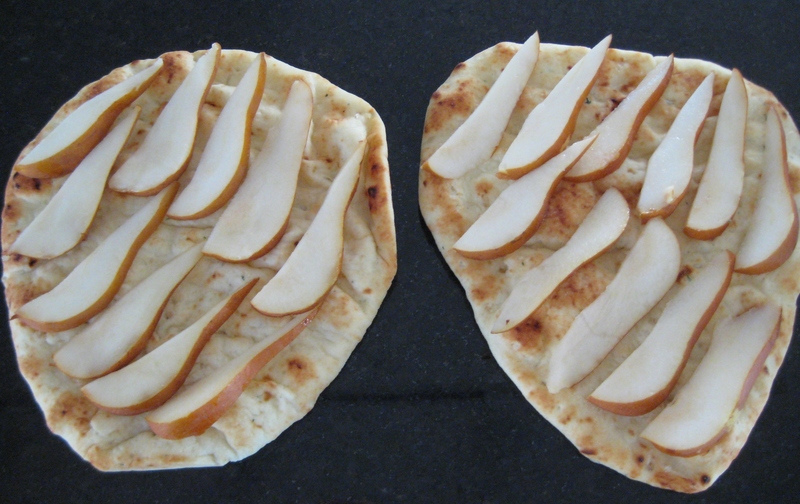 Slice thinly and arrange evenly on the flat bread. 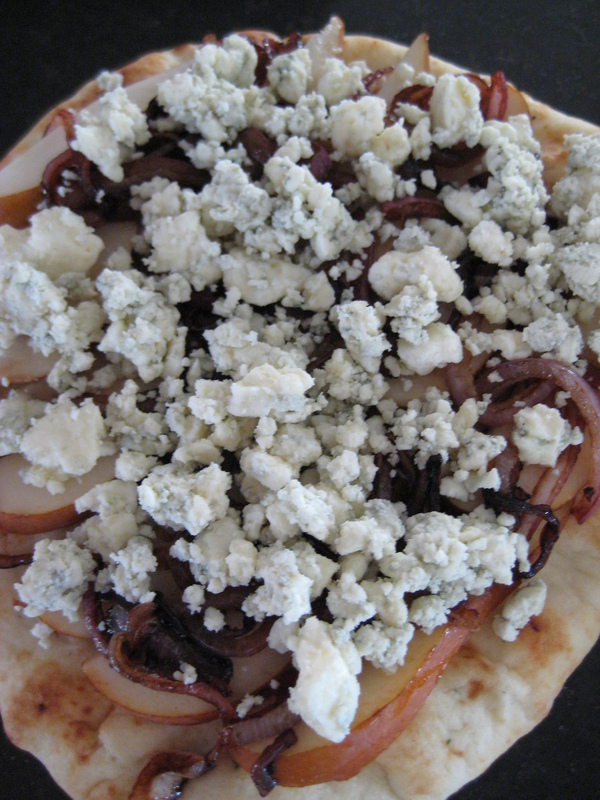 Place the caramelized onions evenly on the pizza. 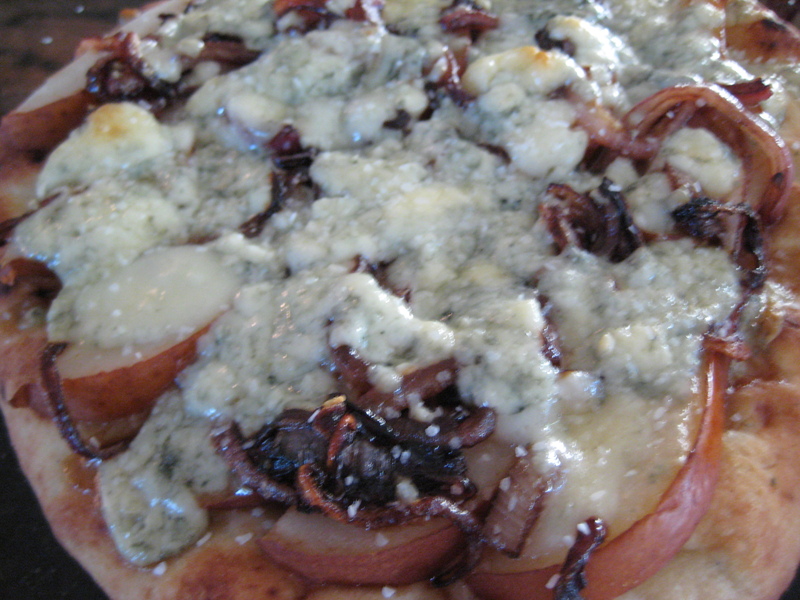 Crumble Gorgonzola cheese evenly over the top. Sprinkle a pinch of kosher salt over the top and bake at 425 degrees for about 15 minutes, until the edges are lightly browned and the cheese is melted. 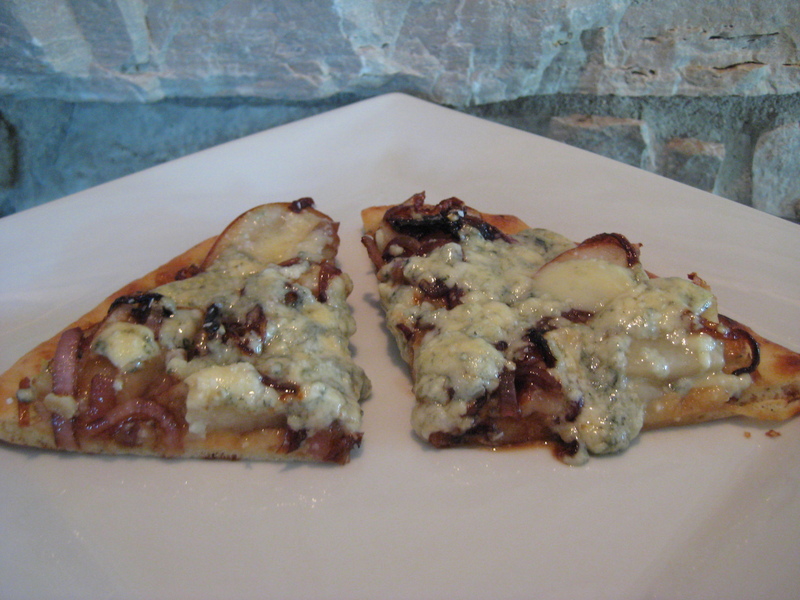 And here it is; the creme de la creme, the tastiest, most delectable flat bread pizza ever. Tastiest ev-er.